Just so there is no misunderstanding, it looks like this offer is targeted. I have not received the e-mail and am going off this FT thread. Nevertheless, I feel this deal is worth passing on and it certainly will not hurt to register for it at the link below. 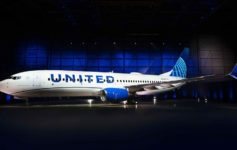 Chase is offering a 20% mileage rebate on your next Saver Award trip on United. Like past discounted offers, all travel must be on United or United Express metal. Unlike past offers, though, travel can be booked into first and business class as well as economy class. Simply register here, book by December 15th (for travel up to 330 days in the future) using your Chase Mileage Plus Visa Card, and your mileage rebate will be posted in your account 4-6 weeks after you fly. You may only use the offer once, but can have up to two passengers on the itinerary and you do not have to be one of them. The rebate will be applied to the Mileage Plus account from which the award was issued, regardless of the passengers traveling. If you book multiple award trips with your Chase United Visa, the discount will be applied to the trip that occurs first. Fine print here. Again, this is likely a targeted offer. Previous Article Off to United Family Day Open House in San Francisco! Next Article Hey 1Ks–Take Advantage of Confirmed Same-Day Changes!